Updated with new textual material, beautiful i llustrations, and a greater emphasis on connecting creation to the Creator! Designed to prepare older high school students for the Advanced Placement (AP) or College Level Examination (CLEP) tests, this fully revised curriculum is intended for teens who have successfully completed high school biology and chemistry. Sixteen modules cover human anatomy and physiology, including the skeletal, nervous, endocrine, lymphatic, digestive, respiratory, and reproductive systems. Student text includes study questions, laboratory exercises, and illustrated module study guides. Hardcover. The Kaplan Anatomy Coloring Book is a recommended resource for this curriculum. Give your high school students a fun and helpful way to build study skills while reinforcing their lessons from Apologia's Exploring Creation with Advanced Biology in Creation, 2nd Ed. textbook (sold-separately). The simple layout integrates graphics, charts, and modern fonts that provide a clean, fresh workspace, while the textbook chapter sections or module numbers referenced by each page or question will keep everyone on track. This accompanying student notebook journal includes 16 modules that correspond to the 16 modules in the text. This interactive resource includes graphic organizers; "On Your Own" questions (with room to answer them); study guide questions; quarterly reviews; diagrams to label, and lots of lined (Cornell-system) note-taking pages specifically designed for students to create their own convenient notebook to study and prepare for tests. Lab report forms for each experiment in the textbook's module are also provided. The back of the book includes an appendix with Latin and Greek word parts, quarterly review answers, and three optional case studies to investigate. 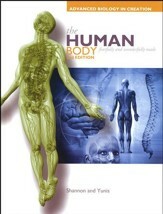 This solutions and tests manual accompanies Apologia's The Human Body, Advanced Biology Student Textbook, 2nd Edition. The softcover solutions manual contains answers to module study guides, tests, and test solutions. A separate booklet containing tests is included. This 2nd Edition set is not compatible with the 1st edition. This set of extra tests is perfect for younger students whose families already own the sold-separately Apologia Advanced Biology in Creation 2nd Edition Solutions & Test Book, and who only need the additional tests, or for students learning in a co-op setting. This booklet contains one test for each module; tests are perforated for easy removal. Answers not included. 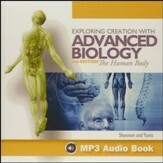 This audiobook CD is an audio recording of the sold-separately Apologia advanced high school textbook Advanced Biology in Creation: The Human Body. Perfect for students who are auditory learners, slow readers, or who have disabilities that make reading difficult. This is an MP3-CD; you must have an MP3-compatible CD player or computer to listen. Grades 9 & up. This instructional DVD accompanies Apologia's sold-separately Apologia Advanced Biology in Creation: The Human Body curriculum. Science can be hard to understand for parents and teens alike! 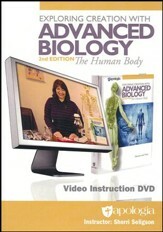 Bring an experienced teacher into your home to supplement your biology course with this instructional DVD-ROM. Apologia author Sherri Seligson will win your teen over with explanations and on-location footage. 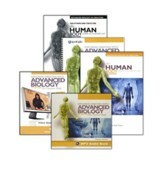 With more than twenty hours of instruction, this DVD also contains video presentations of every experiment from the Exploring Creation with Advanced Biology: The Human Body textbook so students will know what their results should look like before performing the experiment themselves. A lecture and instructional video for each module is included. You must have a DVD drive and program (such as Quicktime) on your computer capable of playing/running .mp4 files and .pdf files. Your computer must have a screen resolution of at least 1280x1024. This is a DVD-ROM, and will only play on a computer, NOT a standard DVD-player. Textbook, Solutions Manual, and lab supplies are not included. 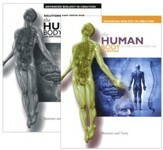 Apologia's The Human Body (Advanced Biology), 2nd Edition textbook has been updated with new textual material, beautiful illustrations, and a greater emphasis on connecting creation to the Creator! Designed to prepare older high school students for the Advanced Placement (AP) or College Level Examination (CLEP) tests, this fully revised curriculum is intended for teens who have successfully completed high school biology and chemistry. Sixteen modules cover human anatomy and physiology, including the skeletal, nervous, endocrine, lymphatic, digestive, respiratory, and reproductive systems. Student text includes study questions, laboratory exercises, and illustrated module study guides. The softcover solutions manual contains answers to module study guides, tests, and test solutions. A separate tests booklet containing tests is included. 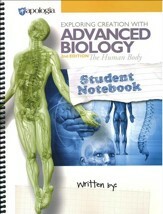 The Human Body (Advanced Biology) Student Notebook will give high school students a fun and helpful way to build study skills while reinforcing their lessons the textbook. It includes 16 modules that correspond to the 16 modules in the text. It also includes graphic organizers; "On Your Own" questions (with room to answer them); study guide questions; quarterly reviews; diagrams to label, and lots of lined (Cornell-system) note-taking pages specifically designed for students to create their own convenient notebook to study and prepare for tests. Lab report forms for each experiment in the textbook's module are also provided. The back of the book includes an appendix with Latin and Greek word parts, quarterly review answers, and three optional case studies to investigate. A complete daily schedule breaks down the text, notebook pages, tests, reviews, and experiments into weekly and daily blocks; following the schedule will enable students to finish the course in 34 weeks. The Audio MP3 CD is an audio recording of the textbook (though in order to improve the listening experience, some words and sentences have been altered from the textbook). Perfect for students who are auditory learners, slow readers, or who have disabilities that make reading difficult. This is an MP3-CD; you must have an MP3-compatible CD player or computer to listen. The Instructional DVD brings an experienced teacher into your home to supplement your lessons. Apologia author Sherri Seligson will win your teen over with explanations and on-location footage. This DVD includes lectures for each module, animated diagrams of difficult concepts, 20 hours of instruction and presentations of every experiment from the textbook so students will know what their results should look like before performing the experiment themselves. A lecture and instructional video for each module is included. The Kaplan Anatomy Coloring Book (not included and sold-separately) is a recommended resource for this curriculum. 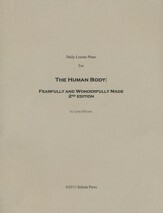 The Human Body (Advanced Biology) Student Notebook, 450 pages, softcover, spiralbound. DVD System Requirements: DVD drive and program (such as Quicktime) capable of playing/running .mp4 files and .pdf files. Screen resolution of at least 1280 x 1024. This is a DVD-ROM, and will only play on a computer, NOT a standard DVD-player. The Kaplan Anatomy Coloring Book that features realistic illustrations, explanatory paragraphs with bolded terminology, and the highest level of accuracy an anatomical guide can provide. This schedule of daily lesson plans is designed to be used alongside Apologia's sold-separately Advanced Biology in Creation: The Human Body Kit (2nd Edition) curriculum. Arranged by lesson, each day's work is laid out for the student with page numbers, problems, study guide questions, when to begin studying, when to take tests, and when to complete experiments noted. Printed-paper; stapled in corner.